Some plastic sheeting now removed to reveal the Arthur Street side of the building. A site at 20/36 Chichester Street and 28/36 Arthur Street with the following planning permission (17 February 2017) “LA04/2016/1789/F Demolition of existing building at 34-36 Chichester Street and erection of new 8No. storey mixed use development incorporating retail and office ground floor, and 1st-7th floor offices with associated external plant. 7-9 Arthur Street 20-32 Chichester Street and existing building at 34-36 Chichester Street Belfast”. 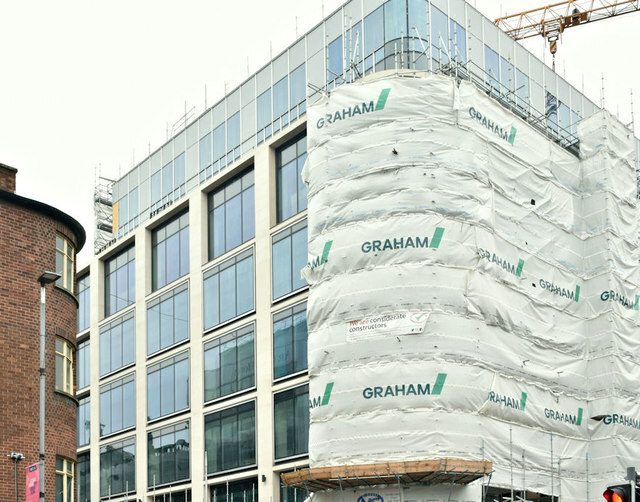 The completed building will be occupied by HM Revenue and Customs.